For the last month I have been testing a Tencel sheets set by Malouf. This is my first experience with Tencel, so I had no real expectations going in. You may have already seen Tencel in other products. It’s a performance fiber used in a variety of fabrics and clothing items. Tencel is exceptionally strong, soft, easy to maintain, and offers great cooling. But can these Tencel sheets pass the rigors of the Sleepopolis sheet test? We put Malouf’s Tencel sheets through our full test! Continue reading below for the full review. Tencel sheets are naturally cooling, moisture-wicking, and super-soft — and these are no exception! Don’t have time to read it all? Click here to skip down to the review summary for the abridged version. The Woven Tencel sheets are built from 100% Tencel. These sheets use a sateen weave. Sateen is the most common weave that you’ll find in most sheet sets. The sateen weave is woven so that there are more fibers on the surface of the fabric. This type of construction creates a soft, smooth, and luxurious feel. The thread count is 300. Thread count is most certainly an important consideration when purchasing a new sheet set. However, it’s not everything. Many companies use thread count deceptively to try and trick consumers. At a certain point, you start to see diminishing returns from higher thread count. 300 thread count starts what I would consider the luxury / performance sheet market. Anything below that and you might see quality / feel issues. However, as you venture upwards of 300 the quality / feel difference isn’t as dramatic as many thread count numbers would seem to indicate (especially when you get above 600). 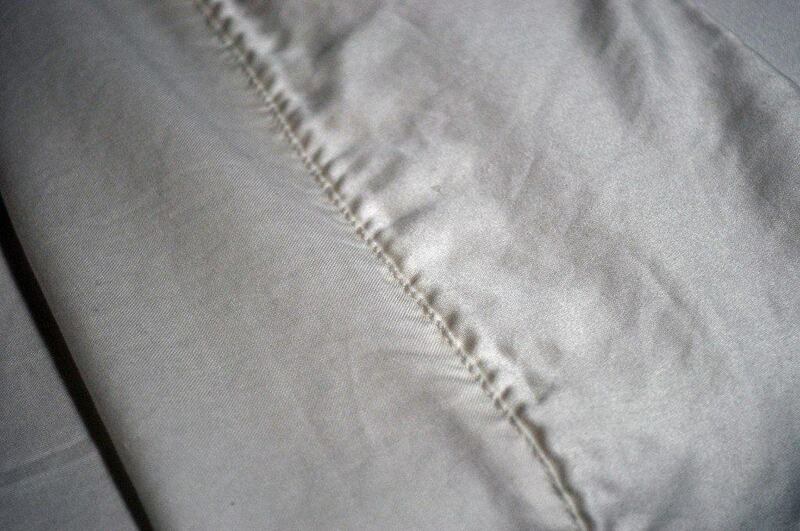 The Tencel sheets by Malouf can be machine washed on a normal cycle. For drying they recommend drying on low heat, and while the sheets are still damp remove them from the dryer and line dry (or hang above the shower curtain rod if you’re an apartment dweller like myself). These sheets are designed as a universal fit. The fitted sheet will fit any mattress with a depth of 6″-22″. Additionally, the sheets are available in a wide variety of colors including: dust, ecru, harvest, ivory, opal, and white…for my male readers, that’s yellow, beige, blue, teal, light pink, and white. Lastly, these Tencel sheets are available in all of the standard sizes including: Twin, Twin XL, Full, Full XL, Queen, King, California King, Split Queen, Split King, and Split California King. For build quality I am primarily focused on the materials, stitching, and overall construction of the sheets. Regarding the materials used, the presence of the Tencel thread at all is noteworthy. But more than that, the fact that it’s 100% Tencel really takes these sheets to the next level. Many Tencel sheet sets, especially those in the $30-$75 range tend to be Tencel blends, usually with cotton. 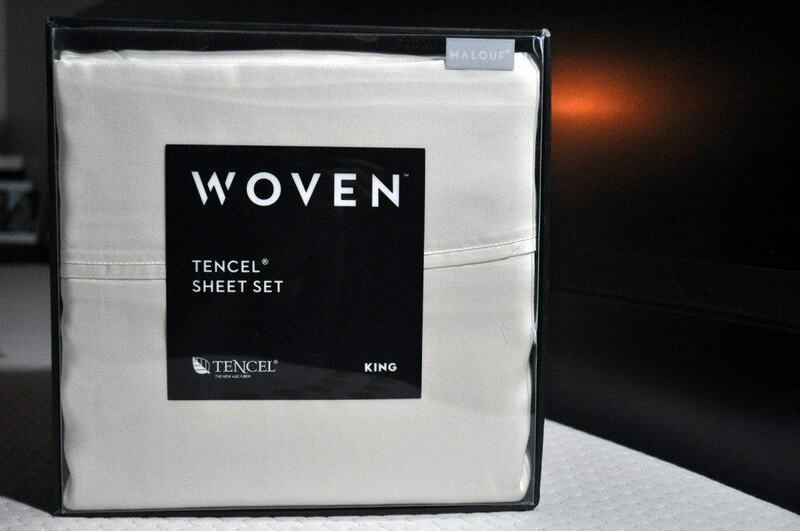 If you’re going to opt for Tencel I think it makes more sense to get a sheet set that’s 100%. The stitching on the Tencel sheets was quite simply incredible. The flat sheet had two 1/4″ loose threads, one on the corner of the foot and one on the corner of the head. Beyond that, the sheets were flawless. There were no flaws on the fitted sheet and no flaws on the pillow cases. The stitching was neat and feels / looks quite strong. Overall, I’m very impressed with the build quality of these sheets, especially for the price point. To test the durability of these Tencel sheets I perform a few simple, but telling tests, that can help to give you an idea of the quality and performance you can expect. First up, we have the shrinkage test. In this test I take measurements before and after washing and drying. Washing / drying shrinkage is a major concern with any sheet set. 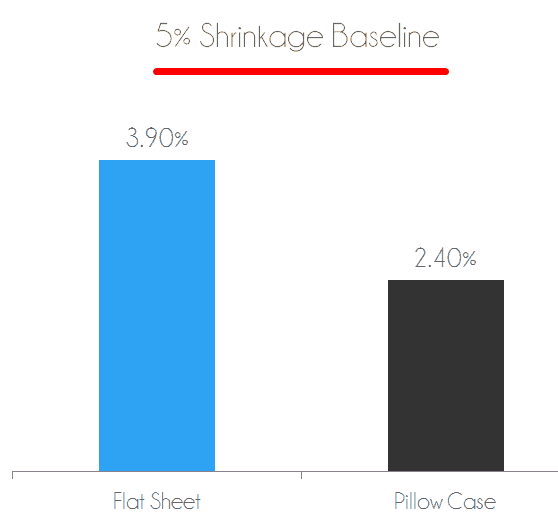 Additionally, dramatic shrinkage can indicate lower quality fibers within the sheets. For the shrinkage test I use the flat sheet and pillow case, as these allow for more accurate measurements. All 4 sides of the sheet are measured for increased accuracy and the total surface area of the sheet is analyzed before and after washing / drying. For the flat sheet I saw a 3.9% decrease in the size after washing and drying compared to the baseline. For the pillow case I saw a 2.4% decrease in the size of the pillow case after washing and drying compared to the baseline. Both of these numbers are quite good and well within normal limits. Any shrinkage below 5% is considered very good. Next, we have the damage test. My first damage test is simply an assessment of the existing flaws in the sheet (see above). Next, I compare any new or exacerbated flaws post washing /drying. Most damage is likely to occur during washing and drying. The two existing loose threads on the flat sheet saw a slight increase in their size post-washing, increasing from 1/4″ to 1/2″. Additionally, I noted 3 other loose threads that surfaced along the primary edge seam of the flat sheet. One 1/2″ loose thread, one 1″ loose thread, and one 2″ loose thread. These threads look like the finishing weave and not the functional sheet weave coming undone. As such, they are less critical of a durability issue. The pillow case and fitted sheet remained in virtually flawless condition. There were no noticeable loose threads or other damage on either of those. Third, we have the color test. In this test, we are testing how well the colors actually stay in the fabric. Colors that bleed indicate a lower quality material and/or dye. 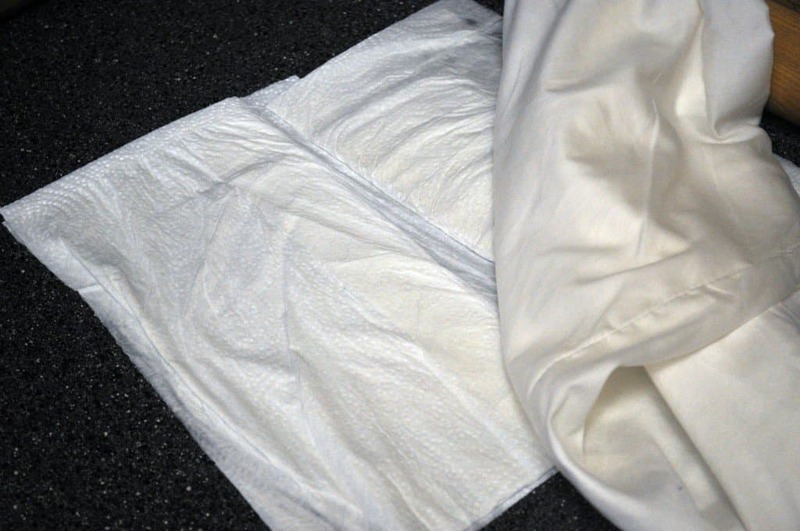 Additionally, it could cause bleeding on your clothes or other items you wash with these sheets. To test the colors I first soak a pillow case with hot water. Next, I wring the water out by using a rolling pin to press the pillow case into a stack of paper towels. Dyes or fabrics of lower quality will easily bleed their colors or other residue onto the paper towels. My testing process show zero discernible dye or other residual on the paper towels. Overall, I have been exceedingly impressed by the feel, cooling, and general appeal of these Tencel sheets. That sateen weave gives the sheets a smooth and crisp feel every time you get into bed. One of the most commonly asked questions and concerns for sheet sets is, “how soft are they?” On a scale of 1-10, where 1 is the most soft and 10 is the least soft, I would rate these sheets at a 2-3 out of 10. The saaten weave combined with the Tencel fibers create a delightful feel. The feel is further helped by the cooling of the sheets. I wouldn’t describe the sheets as feeling “cold”, but they certainly have a noticeable coolness to them when you first lie down. The coolness largely persists even after lying in the same position for several hours. They feel slightly less cool than after the initial lie, but even after hours they are ~80% as cool as when I first got into bed. Tencel is turning out to be one of the most interesting materials I’ve ever tested. More absorbent that cotton, softer than silk and cooler than linen. At the conclusion of my tests I feel that all of these claims are substantiated. When compared to a 100% cotton sheet Tencel is noticeably cooler and softer. 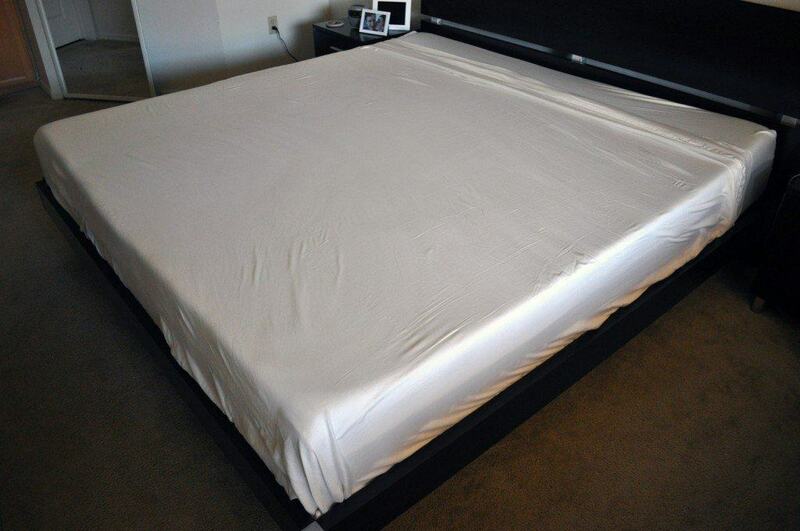 Additionally, the sheets do a great job of continually wicking sweat from the sleeping surface. Tencel fibers actually trap moisture within the fiber itself, beneath the surface of the sheet. This is what helps the sheets stay cool, while also greatly reducing bacteria growth (decreases by up to 2000 times vs. synthetic materials based on a 2004 lab test at Innsbruck Medical University). These Tencel sheets have a clean and modern aesthetic. There’s very little in terms of added adornment or finery. Just exceptional materials, simple design, and great build quality. Should you buy the Woven Tencel sheets by Malouf? There are few sheets that have impressed me quite as much as the Woven Tencel sheets by Malouf. They are affordable, well made, use high-quality advanced materials, sleep cool, and have a nice softness to them. They are everything you would expect a great set of sheets to be. Want a soft feel – these Tencel sheets have an above average softness. On a scale of 1-10, where 1 is the most soft and 10 is the least, I would rate them at a 2-3 on the softness scale. Want great cooling – the combination of the breathable fiber and moisture absorptive properties allow these sheets to provide a noticeable difference in terms of cooling. Even after several hours of sleeping in the same spot the sheets continue to have a crisp and cool feel. Want luxury sheets for an affordable price – at ~$90 for a Queen set it really is hard to go wrong with these. Great material quality, solid build, and good feel. They are a small bump in price vs. cheap sheets, but a massive bump in performance. Want Eco-friendly – Tencel fibers are created in a closed loop system. The solvent used to process the fibers is 99% recyclable. For more information on Tencel visit LenZing-Fibers.com. To shop for the Woven Tencel sheets by Malouf visit Amazon.com. The Woven Tencel sheets by Malouf are everything you would expect from a luxury sheet set. They have a delightful crisp and cool feeling, combined with great softness and a simple modern aesthetic. Made from 100% Tencel fibers, these sheets offer a dramatic performance bump over more common fibers. And finally, at $90 for a Queen set these sheets offer tremendous value for all sleepers.